Alex commented to me yesterday, when I told her what the Gospel reading appointed for today was, haven’t we heard that recently? Her question, echoed my own frustration, and implied a certain amount of ‘not that one again!’ In answer to her question, no we haven’t this story for a while, in fact it is a reading appointed for this Sunday every year. As a preacher, it is one of those passages that is so well known, and much preached on, therefore this preacher could not help but feel that I had nothing new to say to you this morning. As you read the passage there are several ways of understanding or interpretting this wedding feast at Cana that John has recorded for us. I would like to point out 5 to you here this morning. Secondly we could focus on the transformation of the water in the water jars used for rites of purification called for by the Old Testament Law, into wine; the new wine of the Kingdom first drunk by Jesus at the last Supper and referred to again in Revelation, implying the replacing of the old Law of Moses with the new, brought in by Christ. Now perhaps you begin to see the richness of this story, but also how hard it is to bring a fresh interpretation to this miracle. Whatever you have taken away from this story in past sermons or your own reading and understanding is all almost certainly good, true and life-giving. Whichever interpretation works for you, there is always an element of God celebrating, of rejoicing like at a wedding, of all that Jesus is doing or will do to forge a new relationship between him and people. This is the central message of the Church. We are not asked by Christ, following the ghastliness of the Hatian earthquake in such a God-fearing country, to go and debate whether the God of philosophy exists; we are not called to just be the compassionate or even the good people in society; we are centainly not called to retreat behind the safety of closed doors and carry on in private. 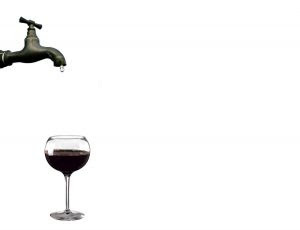 The Danish philosopher of the 19th centuray Soren Kierkegaard said ‘Christ turned water into wine, but the church has succeeded in doing something more difficult, it has turned wine into water...’ It is, if you excuse the pun, a very sobering thought. Have we, by the things we say, the way that we live, the way that we worship, reversed this miracle so much that when people come to church or come into contact with us as Christians they taste, not the best wine (good worship done to the best of our ability, love between us as people, the presence of God himself), but water which is either flavourless and dull or at worst stagnant which has to be thrown away. Have we made the message we have been sent to tell the people of our village in our day, once so full of rich and sweet flavour, now so flavourless so as to be not just unappealing but pointless? From Cana’s water in wine to Calvary’s blood and water, in this sweep we see Jesus’ whole life as one miraculous event, an invitation into an eternal relationship of love. I believe that in this Gospel my friends, God is offering us a challenge to be his Epiphany people again, sharing the sweet and rich wine of the Gospel with our community through some new things that we will do together this year - whether that is people trained to visit the sick and bereaved and show God’s love and care; through services planned in small groups together with me bringing the needs and life of the community to God in our worship; through the warmth of the welcome that people receive we they worship with us. God calls us to prove Kierkegarrd wrong. Amen. PS: I don't think I have been ready for a Sunday this far in advance, ever!